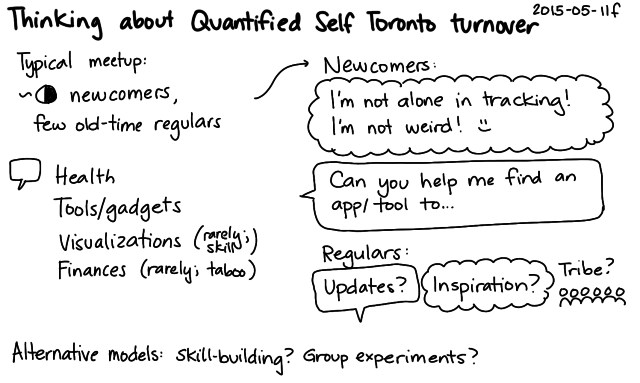 What kind of tribe do I want to build around Quantified Self in Toronto? It’s much easier to hang out with other parents and their kids than with child-free friends. Parents are used to pausing and resuming conversations as we follow our kids’ interests. They know scheduling is super-flexible and it might take three times longer to walk a short distance than Google Maps estimates. The actions and recent developments of our kids give us many things to talk about. It’s great to be able to share snacks and baby wipes, and to watch out for each other. They usually have memberships to the same sort of kid-friendly places A- and I like: reasonably quiet, with lots of things to explore. But my friends are my friends because I like who they are as people. I learn from their lives, and I appreciate that people like them exist. I don’t want to move out of their orbits permanently, or even wait until A- is old enough for me to leave her for an afternoon or an evening. They’re also grown-ups who can make the most of the moments when A- pulls me away. A- generally takes one nap these days, and I can usually get away without napping along with her. She doesn’t have a particular schedule. If we have company, I might be able to get her to sleep in the carrier. The ideal situation is when child-free friends are also good friends with parent friends. Then we can all hang out, and despite divided attention and fragmented conversations, we can usually manage to talk about interesting things. Home is the best place. A- is comfortable. We’ve got space to spread out and let her do things on her own whenever she wants to. I’m a little intimidated by the thought of hosting with food, since it’s still a bit hard to get groceries or cook with A-. But maybe I can find a few forgiving, freezable recipes that I can make ahead (zucchini muffins! ), and I can ask people to bring things they might enjoy. Afternoons are best because A- is awake and we can keep our evening routines smooth. Most people aren’t available during the week, though, so maybe I can see about setting up a Sunday afternoon thing once a month. I’m still looking for places in Toronto and Manila that can serve as a good base for grown-up socializing. During good weather, the parks in Toronto are great for picnics and walks, so maybe I should see if there are parks/playgrounds like that in Manila too. (And what time to go, considering the heat.) She’s a bit too small to play independently in public playplaces like those occasionally found in fast food restaurants. Big, uncrowded spaces work better for us, so she can explore while I remain close by. The Mind Museum in Manila and the Ontario Science Centre in Toronto are among our favourites. Meals are another possibility: restaurants with high chairs, food that A- likes, and my own grab-bag of crayons, paper, and other things for kid entertainment. I prefer to not have her confined to a chair for a long time – and she usually clambers out of it quickly anyway – so that’s more for 30-minute charts. I’m mostly distracted by feeding her and keeping things from spilling, though, so I’m not much of a conversationalist. I can continue seeing Jen and E- weekly, since we’ve got a good rhythm for field trips. I can invite Eric whenever it makes sense, since he’s a mutual friend who has a flexible schedule. I can work on setting up a similar rhythm with Joy and J-, maybe on Tuesdays, or introduce them to Jen and E- for more fun. I can see if flexible, low-expectation planning works for having people over on Sunday afternoon. It can always be a supermarket rotisserie chicken dinner thing, I can ask people to bring stuff, or we can have stuff delivered. When W- wants more focus time, I can plan to see friends at a park, restaurant, or something like that. This might be good for getting back in touch with both parent and non-parent friends. Hmm. Reviving my social life also ties in with helping A- get to know and interact with more people. I think it would be a good use of my opportunity fund. I like the things I’ve been learning from friends’ lives. Since people generally don’t write as much as I do, it’s good to talk to people more regularly. The limiting factor is probably me more than other people or A-, so if I rejig my thoughts (yes, people can bring stuff, I can pay for delivery, people can be flexible, and I can trust that I’ll hold up my end of the conversation), that might open up more possibilities. Let’s give it a try. I’ve been going to a workshop on parent advocacy skills. One of the sessions was about assertive communication: giving yourself permission to express your feelings and ask for what you want in a respectful, confident, and specific way. I’m familiar with the techniques (I statements, active listening), but it’s always good to practice and to see how other people might handle a situation. It also got me thinking about what I do want to learn when it comes to advocating for A-, and how to make the most of my strengths and work around my weaknesses. I think there’s often a lot of leeway in how to solve a problem, especially if you try changing perspectives. Just like in tech, some ways are much easier and some ways are much harder. It’s easier to work with a system than against it. Asking different questions opens up other possibilities. That’s been my experience with tech. Human-centric fields are even more fungible. If you can get people to want to help you, they can bring their creativity and resourcefulness to the table. Conversely, if you get on someone’s bad side, they might drag their feet, or they might follow the letter of the law but not the spirit of it. And you can’t just keep testing until something works! To make assertive communication easier, I like doing my homework. I research the possibilities and the trade-offs so that I can make better decisions and ask for specific things. I like knowing alternatives and having backup plans, because that takes the pressure off. I like reading policy manuals or getting the inside scoop from people because that gives me an idea of the structures that people work in, what tools are available to them, how they’re evaluated, what makes their day better, what makes them look good to their boss. I find systems fascinating, even when they don’t work perfectly well. We’re going a little outside the mainstream for a number of things, so it helps to know what’s out there and how to support any exceptions we want. I’m working on getting better at dealing with different communication styles. Fortunately, this is rarely a problem. I minimize encounters with aggressive people, and I’m pretty comfortable disengaging from things I don’t like. I’ll dig into conflict resolution a bit more when I run into things I don’t want to work around, but in the meantime, there’s so much potential in yes-es that I don’t have to chase after any no-es. Rather than conflict resolution, I mostly want to focus on understanding the systems here. What resources can I draw on? What’s easier and what’s harder? How can I work around any bumps? How can I give back and make things easier? Based on the stories of other people in the microphthalmia/anophthalmia support group, it’s possible that she’ll enjoy school and develop a great sense of humour about her eye, but it’s also possible that she might have to deal with rejection or even bullying. I’m looking forward to learning how to work with or around whatever I can. We walked her through solving the problems that stumped her. 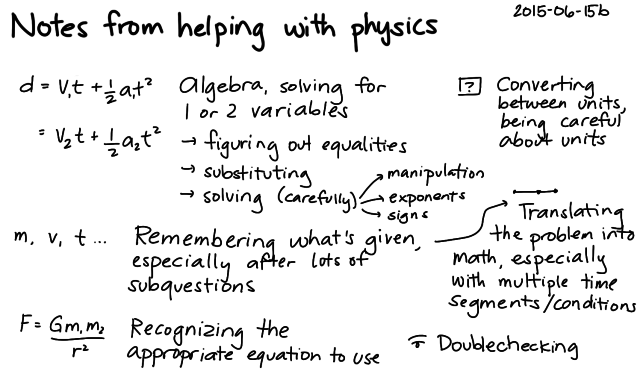 Lots of math and science problem solving is about pattern recognition: seeing how the problem you’re working on is similar to other things you’ve already done (possibly with help), and adapting your experience to the current situation. Having someone sketch out a map and provide quick feedback can make studying a much more productive and less frustrating experience. Algebra’s a big one. I’m not sure how you can develop fluency in that aside from practice and different ways of exploring it. Practising this seems pretty low on the priority list once homework’s finished and even lower priority during vacations. On the other hand, it’s hard to cram understanding when the pressure’s on. I think either John Mighton’s The End of Ignorance or The Myth of Ability had some tips on helping people develop a more intuitive understanding of algebra. On a related note, there’s also the challenge of translating a word problem into the appropriate math, especially when multiple parts or equations are involved. Maybe we can think out loud more often, modeling the real-world applications of this skill. There are the usual small mistakes related to doublechecking one’s work or getting the units straight, but she’ll get the hang of that. J- will be taking more physics, chemistry, and biology next term, so it might be good to do a bit of this review during the summer. In general, I get the impression that she’s doing pretty well, especially compared with the rest of her class. Attendance at the Quantified Self Toronto meetup has been low lately, and it’s a good time to think about revitalizing or even redesigning the community. The way it is now works okay for newcomers. I imagine the experience for newcomers is mostly like: Wow, I’m not alone! I’m not weird! There are other people who track stuff! (I know, I get that feeling each time I go too. 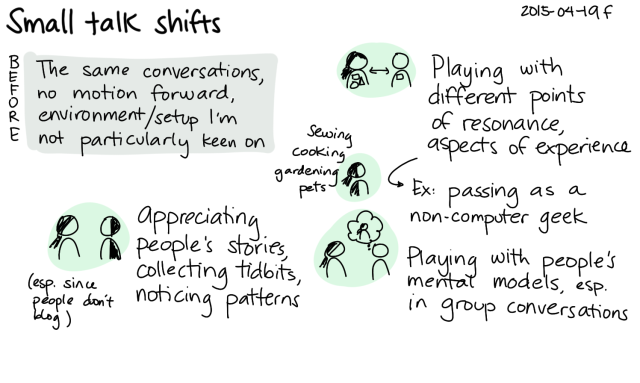 =) ) If they work up the courage to share what they’ve been learning, they often pick up plenty of tips and ideas, and they can connect with other people tracking similar things. From regulars, it’s great to hear updates or find out about other things they’re tracking. The talks do tend to be a little repetitive. Often it’s about people sharing data collected using apps or devices with predefined visualizations, and the occasional self-promotional bit. Sometimes we get new analyses or unconventional experiments, and those are the kinds of talks I enjoy the most. The repetition is understandable – good, even. I think that’s mostly because each person has to go through an individual journey. Even if two people present the same topic and have similar conclusions, it’s good to recognize each of their experiences. Mmm. If I could selfishly redesign this community to be even better-suited to my interests, what would it be like? I go to Quantified Self Toronto meetups because I like the kind of people who use data to make better decisions about their lives. I particularly like it when someone’s curious about something off the beaten track, whether they’re collecting data on paper or they’ve built their own tools. Experimental manipulation is also interesting for me. I also like having the occasional nudge to design, conduct, and report on my little experiments. I’ve talked about a lot of odd things over the years (like cat litter box use, and more recently, sewing), and I like resonating with people in an unexpected way. At the Quantified Self Conference I went to in 2012, I gravitated towards people who tracked their own questions or even built their own tools. I don’t expect the majority of Quantified Self Toronto to be creatively technical, but it might be interesting to attract and retain a core of people like that. What would make 2-3 hours worth it for them, and what would make it more worthwhile for me? Alternatively, what are other ways I could build that kind of tribe? I think education, inspiration, and shared experiments might be interesting to play with. Hmm… The same combination could help encourage newcomers to develop along those lines, too. Might be worth looking into. It’s also fun building up little chains of stories with the kinds of hooks that make people say, “Wait, what?” Some examples of things that are incongruous or that provoke curiosity: semi-retirement, step-parenting a 17-year-old, combining laser-cutting and sewing, disassembling a washer/dryer, wearing a vest with an unusual number of pockets. Weirdness is useful. Ideally, this weirdness brings out disclosures of other people’s weirdness, or prompts them to connect me with someone else they know, or demystifies something and encourages them to explore it. As for me, I like finding out if someone is the kind of person I might want to get to know further – perhaps collaborate with or mentally model. I look for people with shared values, interesting experiments, and a sense of growth. Experiments are good because we learn from the divergences. That said, sometimes I can be too weird – when something I do or something I experiment with is just too far from someone’s worldview to relate to or understand. 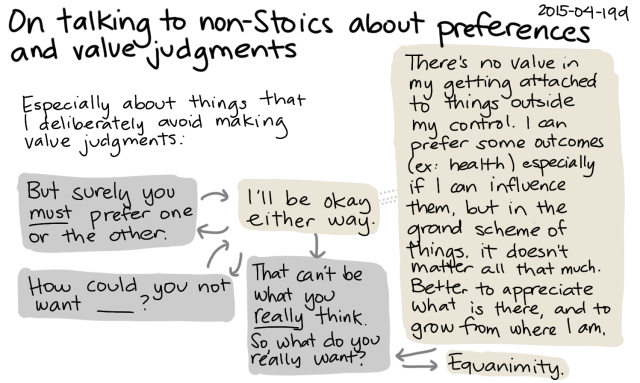 For example, sometimes I talk to people who just don’t get Stoicism, simple living, homebody-ness, tech customization (especially Emacs), quantified/experimental thinking, or blogging. That’s cool. I don’t need other people to validate me and I don’t need to convert other people to my perspective, so it’s really more of an opportunity to explore. Here’s a more detailed example. I talk about value judgments surprisingly often because people often press for information on whether I’d like to have kids, which I suppose is a standard small-talk question for women around this age. Harumph. They usually have strong opinions one way or the other. This is one of the things that I’m careful to not have strong value judgments around or be attached to specific outcomes for. Sometimes I use this as an opportunity to prod people to be more considerate about things by considering a wider range of scenarios. Sometimes I frame my response in terms of being happy either way. It’s pretty rare to find people for whom this position makes sense. Many people are quite boggled by it. But I talk about equanimity anyway in case that resonates with someone who’s been looking for that concept, and even if it doesn’t sink in, I can rest in the knowledge that it makes sense to me. On the other hand, my favourite kinds of conversations are with people who have deliberately cultivated their own differences from the mainstream and who can reflect on those experiments. Then our conversations become a high-bandwidth sort of brainstorming and swapping of notes. 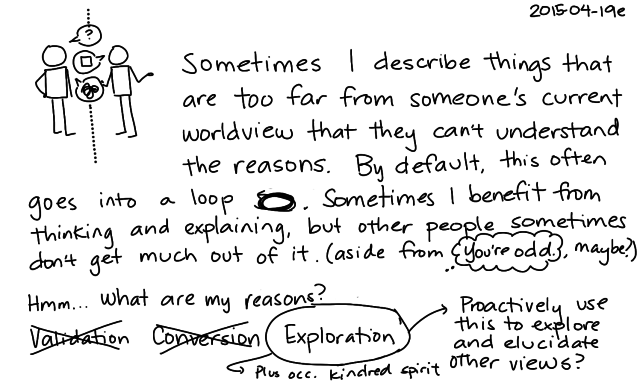 =) We might be doing different experiments, but we can understand and learn from each other’s perspectives.